A protest icon named Scabby is unjustly targeted by President Trump's labor counsel. Howyadoin? Name’s Scabby. Don’t look at me like that. I know, I know: I’m a rat. An inflatable rat. So what? You should be used to my kind, even to rodents of unusual size like me. You see us often enough outside companies when workers on strike and their unions want to embarrass employers they think are up to labor-busting no-good. You might think I’m ugly. But free speech can get ugly. For decades, courts have said I’ve got a First Amendment right to stand where I like. Now along comes the general counsel of President Trump’s National Labor Relations Board, Peter Robb. He wants me to swallow some poison. Last month, in legal papers, the board suddenly started arguing that the 30-year precedent that lets workers blow me up ought to be blown up. Thankfully someone ratted Robb out. Now, don’t let him scurry away. 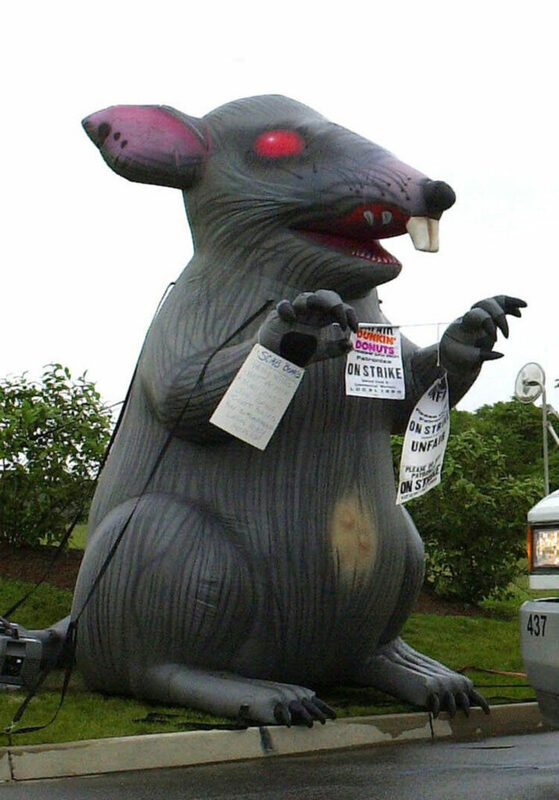 Free speech can get ugly, says Scabby the rat, here deployed in June 2001 outside a Dunkin Donuts distribution center in Woolwich, N.J.